I really don’t know what our problem is. We live life under such strain of anxiety, stress, and worry. People ask me why I don’t worry. The answer? I don’t not worry. I just don’t worry often enough or hard enough for it to register on the “he’s obviously worried” scale. So, don’t think I’m some superhuman who’s above the capacity to fret. Oh, I fret. But here’s the thing. Of all the problem-solving strategies out there, worry is the absolute least effective. Its a strategy that has never worked. Nor will it ever. And yet we employ it. We’re a crazy bunch, aren’t we? People who don’t believe in a God are fascinating to me. And more times than not (fair or unfair) they come off as arrogant. And a wee bit angry. And also pessimistic. Me? Not only do I believe in A god, I believe whole-heartedly in THE God. See that capital G? Yep. That one. I haven’t know this God my whole life but it seems like for most of my life I’ve known something of Him. I heard stories. I heard people talking. Word got around that there was this God that actually did stuff. Important stuff like loved, helped, rescued, and healed. To me, the evidence for the existence of THAT God is overwhelming. Nowadays (as always) there are people going around shooting and beheading people like me who claim to know and love that God. And when one of those gun or machete toting hooligans comes my way and asks me what I believe? Well….let’s just say I’ll catch you on the flip side. Why? Because I can’t deny what I’ve seen, learned, experienced, and been convinced of. I can’t. Take your atheism all the way to Timbuktu for all I care. Me? I’m sticking with God. Take a look at David the kid who’d later become David the king. His brothers were all in the Israelite army and were camping across from the Philistine army. Maybe you’ve heard this story. Stick with me. 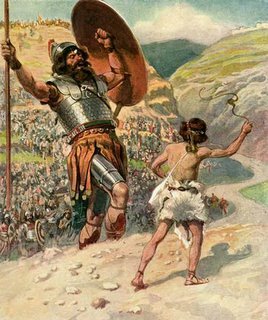 Little Davey comes out to deliver some cheese curds and whey protein to the soldiers when he sees them at a scared-frozen impasse because of this big dude named Goliath who was the “champion” of the Philistine army. And then David pulls out his shepherd’s slingshot and nails the giant in the head. The stone SINKS IN to the skull of Goliath and drops him to the ground. Then David does something so street, so gangster, it just can’t be overlooked. You remember that sweet sword the giant had? David pulls it from Goliath’s hand and hacks the giant’s head off. I love it. He could’ve just walked away, back to the army of Israel and said, “Okay boys, I did the heavy lifting. You finish it up.” But when you’ve got the God of Israel, the God of the universe, the God of infinite design, the God of all-power at your back…well….you don’t shrink away from anything. That’s the God I love. That’s the God I serve. That’s the God who’s making a way for me right now. That’s the God who’s at my back. And my side. And going ahead of me working things out for my good and His glory. So today, if you’ll excuse my slight swagger, I’m walking with a giant’s head tucked under my arm. Because I’m walking with the King.